Let Sears Maid Services handle your home's cleaning requirements so you can get back to taking care of what matters most. For a thorough cleaning in both residential and commercial settings, the professionals at Sears Maid Services have you covered. All of our experienced teams are locally operated to provide personalized house cleaning services and have the expertise to quickly and easily complete any cleaning job. Sears Maid Services offers both Deep Cleaning services as well as ongoing services through regularly scheduled appointments. We have the expertise to expertly clean everything from inside microwave ovens to bathtubs, and we tackle the more difficult cleaning tasks so you don't have to. Our house cleaning experts are ready to clean every room in your home, including kitchens, bathrooms, hallways, living rooms, dining rooms, and more. Give us a call at (614) 827-3535. We recognize that you have other chores to do than clean, which is why Sears Maid Services is available to take care of the house cleaning for you. There's no need to interrupt your schedule either. We work with you to set up regular home cleaning services that work with your busy schedule. Whether you need weekly, bi-weekly, or monthly services to maintain the beauty of your home, apartment or condo, Sears Maid Services can help. We can also perform a Deep Cleaning of your home once or twice a year for spring cleaning or after a party or event. A Deep Cleaning includes all the benefits of our normal cleaning, along with additional attention given to more difficult cleaning tasks. Sears Maid Services performs commercial cleaning with the same level of due diligence that reflects the superior level of service your company offers. The level of cleanliness at your place of business directly correlates to the level of service your clients, vendors, and staff can expect from your company. A clean, tidy office not only motivates employees but can also improve efficiency. Let the professionals at Sears Maid Services keep your office in pristine condition with regularly scheduled cleaning services. Our staff is fully trained in commercial cleaning and will empty waste baskets, clean staff kitchens, sanitize bathrooms and more. Are you getting ready to hand over the keys to new homeowners, prospective buyers or real estate agents? Let the professionals at Sears Maid Services get the house ready for viewing with a thorough cleaning. Construction is messy, and it is common practice to use a post-construction cleaning service to provide the finishing touches. 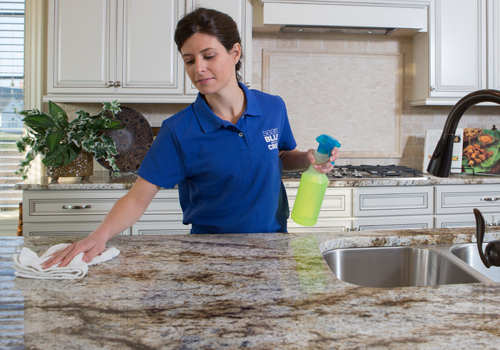 Trust the cleaning to the professionals at Sears Maid Services to realize the most return on your investment. We take care of everything from mopping the floors to sanitizing surfaces to ensure your new construction gives a positive first impression. You can rely on Sears Maid Services for trustworthy, superior cleaning services. Professional integrity and expertise are cornerstones of our business. We work hard to build long lasting client relationships that you can rely on. We vet every staff member and perform extensive background checks to ensure that each professional on our team works toward the same goals and level of service. We don't stop there; we continue to encourage employee training and development to provide only the best services for our clients. Our level of commitment to both clients and employees doesn't stop at providing superior house cleaning services; we guarantee every service we provide. If you are not completely satisfied, simply let us know within 24 hours of your last appointment, and we will send an inspector out when it is convenient for you. If something was missed, we will return to clean it up at no extra charge to you. The service was excellent and the house was sparkling! Our team was just phenomenal. Everything looked so perfect, right down to the lovely, freshly-vacuumed pattern they left on our rugs. I request that ONLY this team come to our home in the future, even if it means our date must be juggled to get this crew. Please let them know how much we appreciate the care they take with our home. I LOVED the cleaning service and definitely intend to call them back to clean again. They did a great job!!! So worth it. The ladies who cleaned my house were amazing and very hard working. I will use Sears again! I've never had such great service. This crew always does a fantastic job. I have been recommending Sears Maid Services to my friends in town. Tina did an outstanding job. Not only was the apartment super clean, but she went beyond in terms of setting things up for my visitors. Highly recommended! Sears Maid Services belongs to The Association of Residential Cleaning. Sears Maid Services is a proud member of The Association of Residential cleaning Services International (ARCSI). ARCSI is committed to providing valuable information to ensure the growth and development of its members' businesses through education, networking and collaboration. ARCSI’s purpose is to provide support to home cleaning service owners and managers, whether they are independent or part of a franchise, and to provide opportunities for to its members to come together to network, learn, and work toward the common goal of increasing awareness and knowledge in this industry. Sears Maid Services is a certified House Cleaning Technician. Sears Maid Services is a certified House Cleaning Technician. An IICRC-certified House Cleaning Technician is trained to properly care for homes and health. A consumer who uses a certified professional can confidently trust the cleaning and relax in a clean and healthy home.